Me VS. 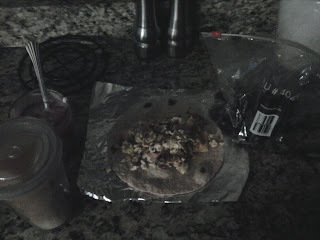 The Sugar...: Blame It On the Breakfast Burritos! I thought Thursday would never come! This week has seemed so long, but at least I get tomorrow off. Woo-hoo!!! I did not want to get out of bed this morning, let me tell ya! I was so comfy in my maternity sleeping pillow, but I got up anyway and got myself to the gym. 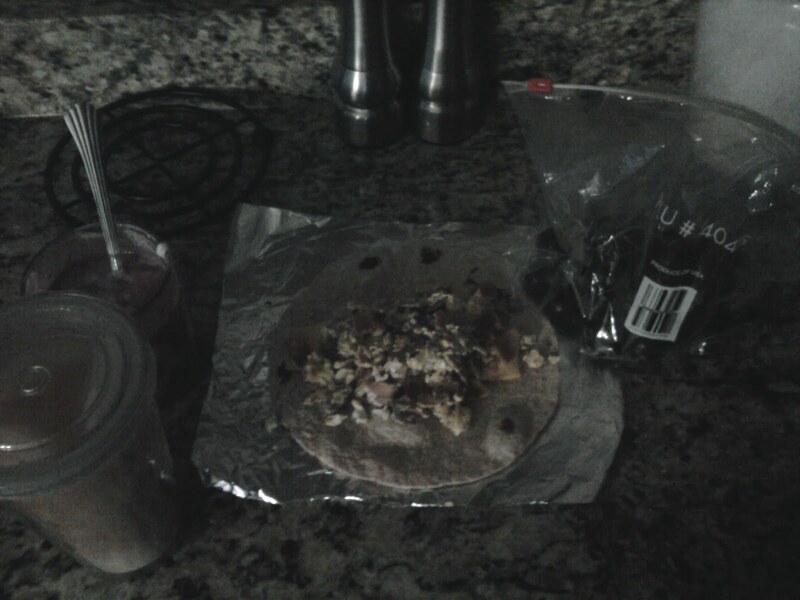 I got to the gym a little later than I wanted to because I made us our breakfast burritos. Sometimes, I just don't have a concept of time. I know I have to leave my house by 6:20 at the latest to be at work by 8 and now I know that 10 minutes to brew our coffee, have my yogurt and make our burritos is just not enough. It was the breakfast burritos fault, though! I did manage to get my 23 laps in, so it's not all bad. I don't know what I'd do without that pool! I go home for lunch every day to let the doggies out, and was looking forward to my whole-wheat chicken calabacita soup that I had already prepped last night. Then, I opened that fridge door and saw that my sneaky, sneaky hubby had taken it for himself!!! Boo!!! 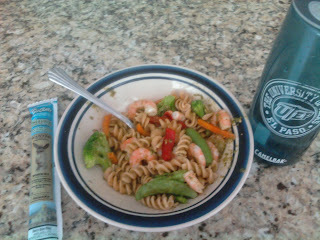 I turned to frozen veggies, shrimp and pre-made pesto sauce with some of the left-over whole-wheat rotini. 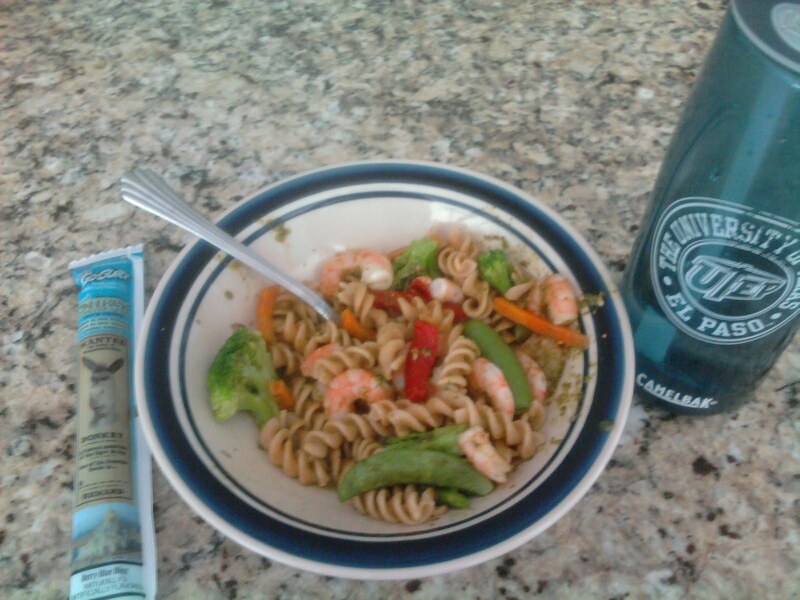 It was actually quite good and it made me realize that having some cooked whole-wheat pasta/rice ready to go in the fridge might be a good idea to keep in stock. 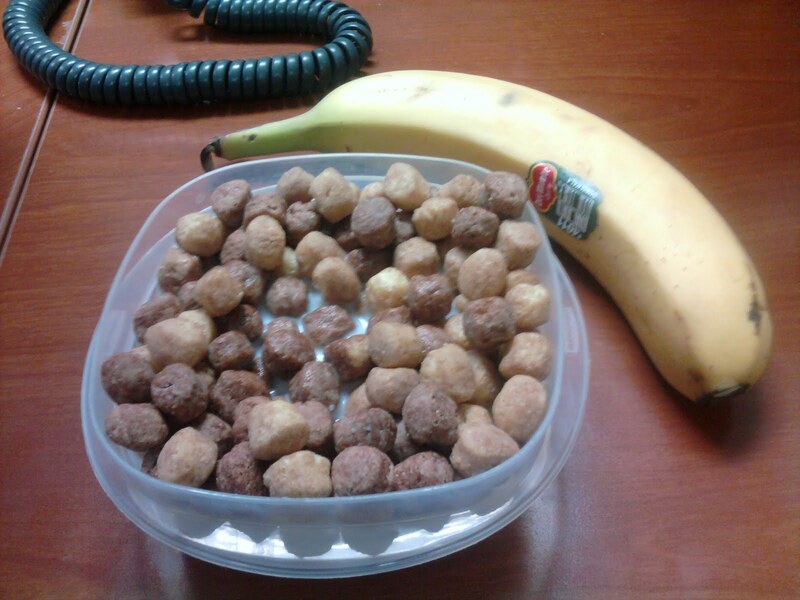 I was really busy at work today, but all is good when it's interrupted with some PB & Choco goodness in the form of Reece's cereal. You have to learn to enjoy the small things in life! I had planned to make this yummy bacon, spinach & pasta dish but I was out of spinach. I thought I could substitute it with asparagus, but when I got home it just seemed to heavy for me. 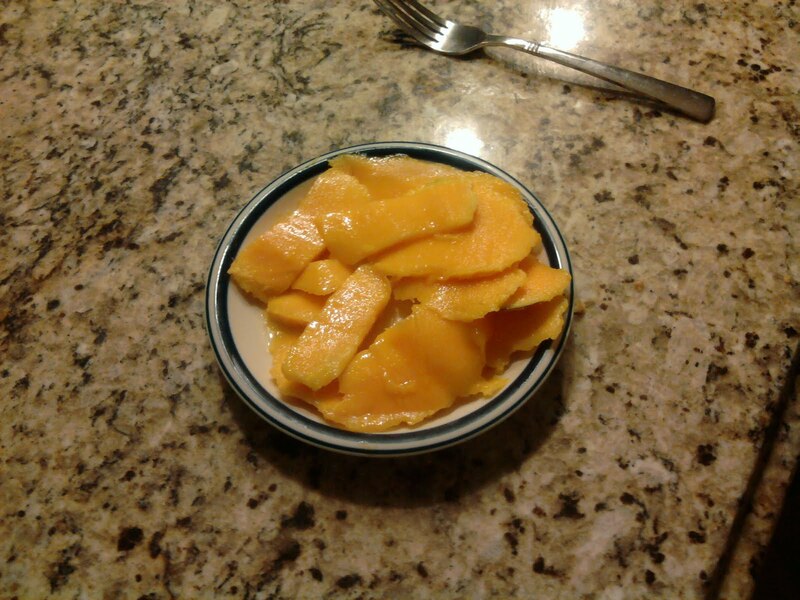 100+ degree weather will do that to your appetite. Since my hubby said he didn't care what I made, I opted for some easy BACON + chicken lettuce wraps. I used some canned chicken and cooked 4 pieces of bacon. I then added some celery and 2 T of ranch dressing. 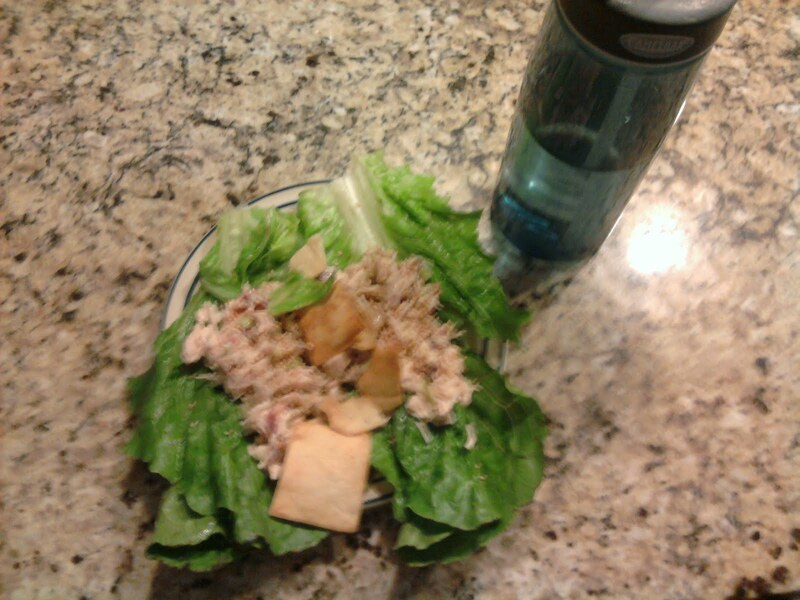 I topped it with some sesame seeds and had some pita chips on the side. Overall, it was pretty good. I love dishes that come together so simply. For dessert, I had some mango goodness. I won't lie, I had a handful of the Reece's PB cereal and almost made a grab for the marshmallows, but I restrained myself. Oh that Sugar was at it again, tempting me with those marshmallows. I said "NO! ", though, and now I'm quite proud for tonight! Only a couple of chapters, I wish I had more time!!! I usually only work out 4 times a week when I get my Friday's off, but I need to add one more workout in this weekend. We always walk the doggies all three days, but I really have to work on my stretching! That'll be one of my goals this weekend.